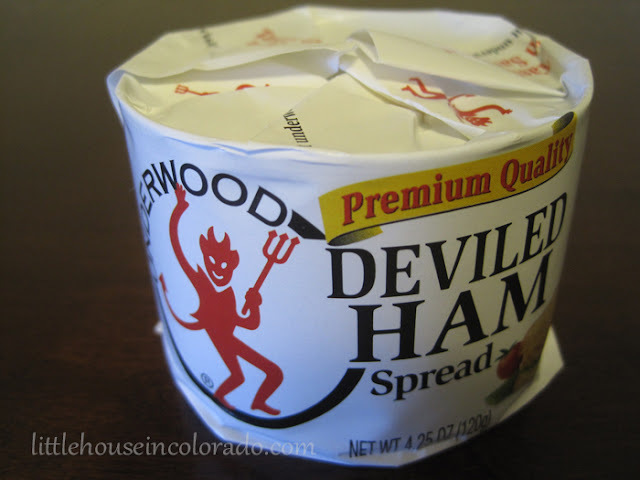 I used Underwood's Deviled Ham Spread. It came in a 4.8 oz can. The recipe did not specify a size so I hoped this one would be the right one. Armour had a potted meat available in a smaller can but it was a mixture of different meats. The eggs I used were not boiled. Instead they were steamed to a hard-cooked state. 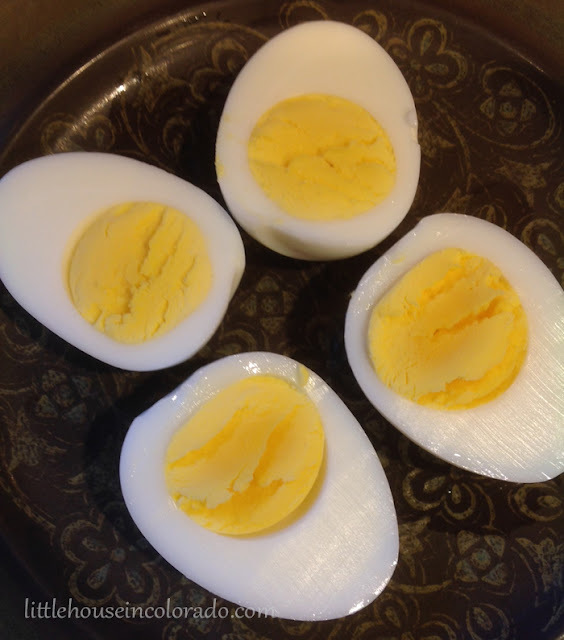 The steamed eggs seem to be a bit more forgiving in their cook time and they peel like a dream! We haven't boiled a single egg since learning this trick. To steam your eggs, simply place a steamer basket into a pot and fill with water to BELOW the bottom of the steamer basket. When the water starts to boil, place your eggs in the basket, however many you want to cook, cover the pot with a lid and steam for 15 minutes for hard cooked eggs. When the time is up, run cold water into the pot with the eggs. The eggs don't have to be cold (my daughter only cools off the shells enough to be able to handle them). However, the colder they get, the easier they will be to peel. Do not use a knife with a serrated edge to cut your eggs. It leaves grooves on the egg surface. Push your yolks through a ricer or sieve to mash them. This avoids lumps you might leave behind if you use only a fork for mashing and mixing. Use a piping bag and tip to fill your eggs. Or if you don't have one, cut a corner out of a zip-top bag and use it. This makes the whole process of filling your eggs less messy. The star tip I used here was a #17 Wilton tip. I would suggest a bigger size. Garnish! Even if it is just a dusting of paprika. 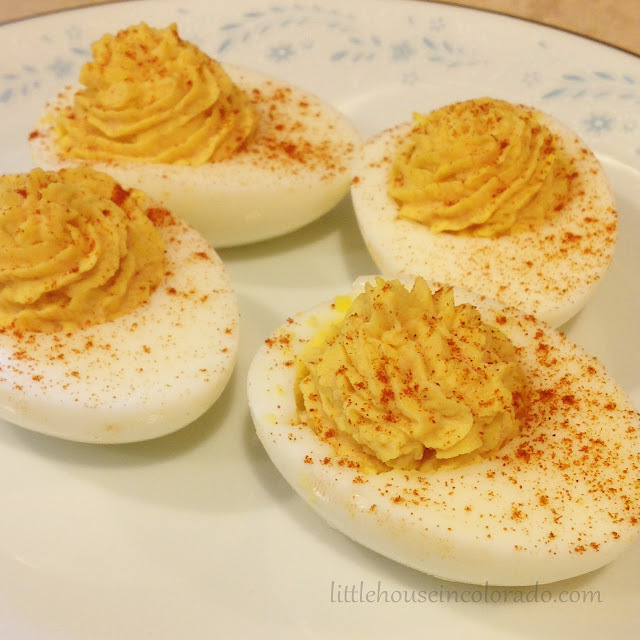 Everyone (else) loved these deviled eggs! I still did not try them. Seriously, I don't do hard boiled eggs...or potted meat. 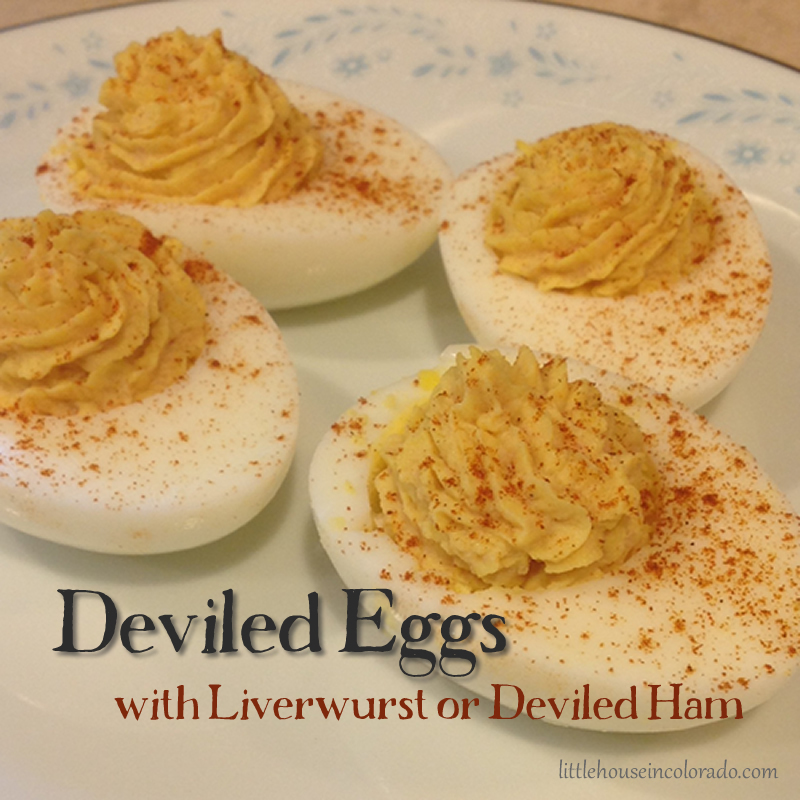 In fact, The boy wants these every afternoon for the rest of the week so we can use up the rest of the Deviled Ham I purchased. The recipe was typed on an index card. 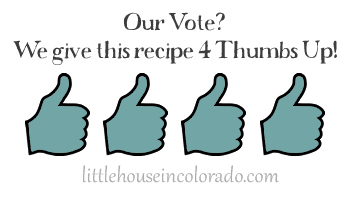 It was found in an old large recipe file box. 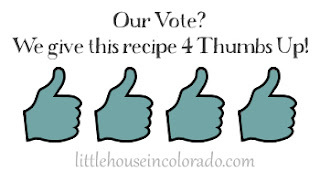 The age of the recipe card is unknown. Halve eggs. Remove yolks from the whites. 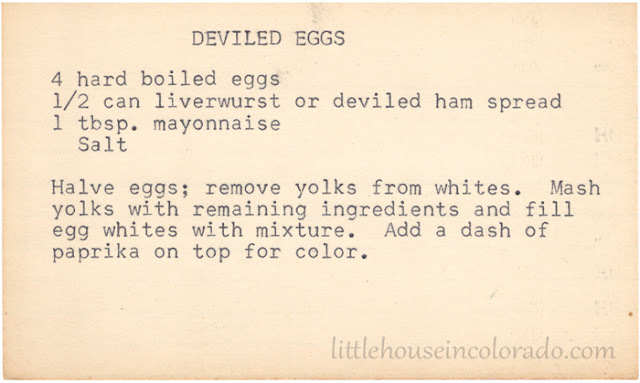 Mash yolks with liverwurst (or deviled ham spread), mayonnaise and salt. Fill egg whites with mixture. Add a dash of paprika on top for color.